It’s easy to like Savannah. I’ve lived here years now and keep finding reasons to stay. I love the history that lives in the bones of the buildings, the iron and granite and gray brick that stir the spirit into visions of early American grandeur and ensures that those who live outside of downtown feel shame about our low ceilings and modern HVAC systems. I love the squares, those mannerly adumbrations of sun and rain that enchant, soothe, and disorient tourists, tempting them into lives of homelessness and palm-frond crafts. I love the city’s size, too, large enough to feel cosmopolitan, but small enough to make it possible to see someone you know every time you’re out at dinner and have had enough liquor to say embarrassing things about a failed relationship with a parent. Which brings me to the city’s finest quality: the people. Savannahians are indeed as friendly as Southerners elsewhere, but there’s something special about Savannah folks. Be they Christian or Jew, pagan or pure as the driven Flannery, you can bet that a Savannahian is emotionally disturbed in some irreversible way. This applies to newcomers, too. Within a year or two of moving to Savannah, even healthy people from places like Cleveland turn crazy and start wearing bowties. Yet, for all there is to love about this city (tall churches, short fences, live oaks, dead heroes, etc. etc. ), there’s one thing that begs not to be loved. And so, as we Savannahians so often do when rushing to a garden party, finding ourselves tracing the ancient route of a Habersham Street square behind a creeping trolley packed with slackjawed, windbreakered Ohioans, I must veer from this pleasant tour of our city’s more wondrous facets and turn down the alleyway of concern. This matter, I must say, has caused my family great distress, ruined friendships, destroyed professional alliances, infected our theologies of love and neighborliness, reduced my cul-de-sac to a seething confederacy of distrust. I speak here of the tragedy we call the Low-country boil, that sacred fête of Savannah springs and summers where shrimp and sausage fraternize with corn and potatoes in a large pot. I come not to bury the boil, but simply to make a small request for something I have come to expect from almost all of my meals: which is to say, flavor. 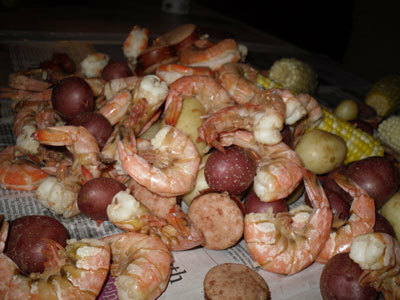 I am quite embarrassed to say it, but the precious Low-country boil simply has none. In my very first year here, I was invited to attend a boil. I was thrilled to sup with a respected native, eager to sample the local provender. I already knew what to expect, as I come from Mississippi, where we host crawfish boils in spring, similar to the Low-country boil except with more violence and fewer napkins. On the day of the boil, I walked into my new friend’s backyard, through columns of steam and past vaporous open coolers of beer, and pulled myself belly-up to a folding table. I peeled the first few shrimp and tossed them in the old gullet. Strange, I thought. The texture and temperature were fine, but they tasted like nothing, not even shrimp. I checked my mouth to make sure my tongue was still in it. As a guest, I did not wish to insult my host’s food preparation, and so I veiled my attempts to look for salt or Tabasco or perhaps a small dish of beach sand that might add some flavor. I looked up and down the table, pretending to look for a friend. “Who are you looking for?” my host asked, sitting beside me now and eating handfuls of shrimp like Junior Mints. I moved on to the boiled potatoes that sat drying on the obituary page. At our Mississippi crawfish boils, the potatoes are little atomic fireballs that remove the enamel of teeth and make people question the divinity of Elvis. And so, I bit into this Low-country potato with the gusto I normally reserve for doughnuts, eager for a taste explosion. But the soft root was tepid, a zero. I held it up in my hand, this tuber that suddenly felt very Colonial, something I could imagine General Oglethorpe, Savannah’s English founder, eating on the boat, its anchor tossed into the mud of Hutchinson Island. Hadn’t they all been looking for spices back then, too? Look, children! This is how the Pilgrims ate! I am no fan of cocktail sauce, as I find it resembles what I have always thought ketchup might taste like after being buried in the earth for a thousand years. Instead, I did what I always do when faced with a great vexation in my life: I drank more beer. I considered dipping my shrimp in the beer, which would have made it taste like beer, which was starting to sound like a plan. A few weeks later, I was invited to another Low-country boil and this time brought along my wife, who had grown abusive to the children and needed to get out of the house. I said nothing, simply waited for her reaction. Perhaps it was all in my head. She took her first bite. “This is great!” she said, for all to hear. Later, as we pulled out of the driveway, she turned to me. “That was terrible,” she said. Then I remembered: My wife is good at lying, like all other human women. “Man, I can’t wait for the Low-country boil!” a buddy said one day after church, referring to our congregation’s annual Labor Day event. “Indeed, remind me to bring my own salt,” I said. He looked at me as though I had just invoked the power of Satan to rain fire on the people of God. He walked away, did not even turn back, perhaps fearing he might turn to a pillar of something. By year two in Savannah, I had grown brash, brassy. “Y’all got any salt here?” I asked aloud one evening, shrimps sticking out of my mouth, as though they wanted to hear the answer, too. “Hush!” my wife said. “Don’t be so rude.” And then she handed me a saltshaker under the table. “I found it in the kitchen,” she said, sotto voce. We became skilled at finding saltshakers and other flavor-based additives in the kitchens and cupboards of our hosts, taking our plates to the restroom for a clandestine shake or two. But on many occasions, we could find nothing. “It was so weird,” I said. “The kitchen was totally empty. No seasoning anywhere.” We were both in the bathroom, dipping our shrimp into a saucer of perfumed bath salts. “It’s like they knew we were coming,” she said. Things turned bad quickly. I began to confront our hosts with questions about ingredients, as I did one afternoon with a next-door neighbor. “Salt?” he said. “This shrimp doesn’t need salt! I use lots of crab boil and spices and whatnot.” He picked up a box of Zatarain’s Crab Boil that missed the trashcan, started reading aloud. “It’s got mustard seed, coriander, cayenne pepper, bay leaves, dill, allspice. Allspice!” he said, as though this last component was nothing less than the legendary bounty of the planet Arrakis in Dune. “I throw in some Old Bay, too,” he said. We were all in our cups now, and I grabbed the Zatarain’s box from the host. “Look!” I said. “What does it say right here?” I shoved the box in front of my drunken host’s face. “At least I ain’t a hick from Mississippi,” he said, pushing the box away from his nose. “No, don’t,” my wife said. “Back where I come from, we do a lot of salting to taste,” I said, growing louder, redder, rednecker. It was true. In Mississippi, we add salt, Tabasco, red pepper, butter, liquor, gunpowder. This is why we place so well in national heart-disease competitions. Last thing I remember, my wife was pushing me out of the party, toward the car. In an act of courage and defiance, I stole a decorative University of Georgia dinner plate from the foyer wall. I no longer go to Low-country boils. My wife does, without me. She likes the company, the free beer. I sit at home, writing, wondering, in the cupboard where she has locked me, close to the seasonings that have brought me so much happiness these many years. These days, Savannah has lost its flavor. The granite and marble and iron are more prison than backdrop to history. The spangled and dew-heavy moss of the squares hangs lower, burdened. Perhaps I am going crazy. Could it all be a great and impractical joke? Is this how Savannah people grow deranged? How soon will I emerge from the darkness of depression and step into the daylight of Low-country crazy? Will the boil taste new then? Will it taste at all? Is this why people around here drink so much? I am sorry, Savannah, for my behavior. Perhaps I’m beyond saving. But there are others, newcomers, arriving on our shores every day. They come by boat and plane, car and train. They come because this fair city has much to offer. Think about them the next time you’re hoisting an armful of seafood and potatoes over a large pot. From the dining rooms of historic Savannah to the marshland porches and the embarrassing outlying communities with their shameful concrete patios and carpeting, I implore you all to upend tradition. Reach into the cupboard. Take up the invitation to flavor. Take up my hand. And let us, lords and vassals of the Coastal Empire, salt to taste. I’ll even bring my own plate. It’s got a picture of a dog on it. I forget his name.